Today the littlest love and I went for a walk to collect some of the last Autumn leaves. Despite the gorgeous sunny days we are having, the winter chill has hit and the trees are almost bare. We had a lovely time crunching in the brown, dried up leaves. We chatted about the shapes, sizes, colours and patterns. Lulu made some pretty leaf rubbings using oil pastels and then added some vibrant Autumn colour using some water paint (food dye with a few drops of water). Next up was an easy peasy collage. I cut a big piece of clear contact and peeled off the backing. Miss 3 arranged the leaves ever so carefully on the sticky side. I love this kind of collage...it's quick, it's easy for little hands, no glue means no mess and it makes a pretty piece of window art. 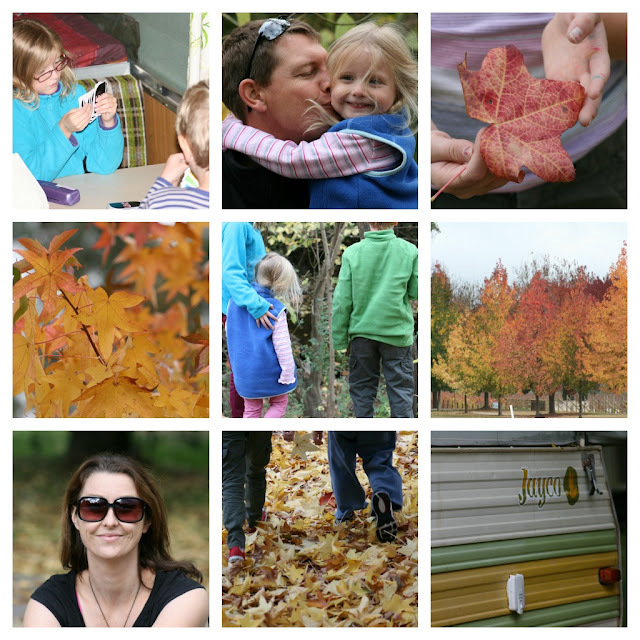 And finally, some snaps that were taken during a little Autumn getaway in our caravan recently. Has the cold weather arrived at your place yet or are you still enjoying the Autumn warmth? Hi Lea! I've just been catching up on your blog posts of late. The little skirts you've been making are so cute! Love the beautiful autumn pics and fun autumn crafts too!